Accepted for installments on most karma payment plans. Void where inhibited. Earlier this week, I attended a Town Hall event in East Atlanta organized by State Senator Vincent Fort and a suite of community groups. The event focused on repealing Georgia’s Stand Your Ground legislation (SYG; GC 16-3-21) and was a deeply powerful experience. Of the many phenomenal speakers that night, one in particular downright tore the roof off with her heartbreaking story and raw power: Lucia McBath, the mother of Jordan Davis, a 17 year-old boy who was shot to death while sitting in a car with some friends in a gas station parking lot in Florida. Davis’ killer, Michael Dunn, a 46-year-old white man, apparently felt that the boys’ “thug music” was threatening, and when the boys refused to turn it down, he emptied the clip of his handgun into the vehicle. Dunn, who had allegedly been drinking heavily at the time, is pursuing a modified SYG defense because he claims he believed he saw one of the boys inside the car reach for a shotgun. Dunn immediately fled the scene; no such weapon was ever found. 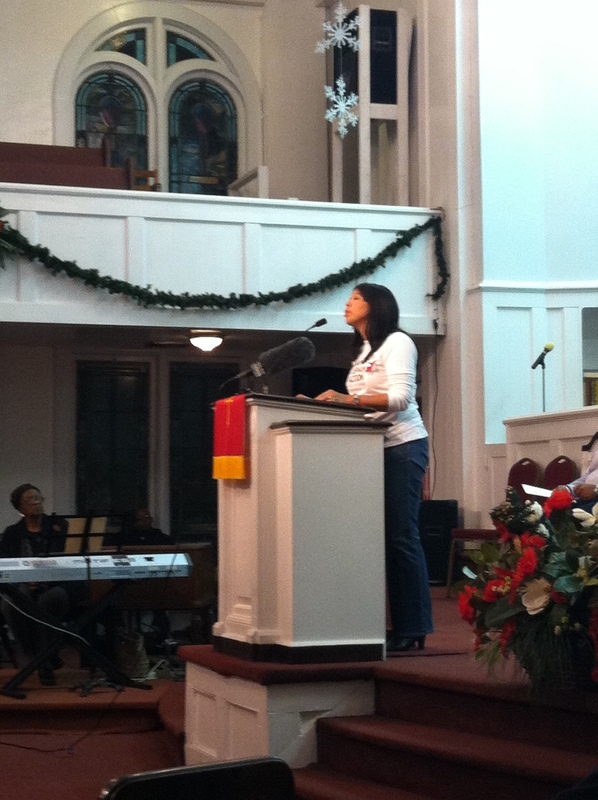 As McBath spoke, people yelled back – “We hear you! We hear you!” – and when the speaker asked for folks to pledge to sign petitions and march and call the Governor the audience response was tremendous. We held hands and prayed and sang and I for one walked out with faith in the capacity of righteous people in numbers to do good, to effect change. And I think these people will. There is so much wrong here. Setting aside some of the more obscene ironies that Harkinson’s on-point reportage highlights (for example, the fact that the California State Teachers Retirement System continues to hold a $750 million dollar stake in Cerberus) the picture that emerges is of deep structures of power and embedded interests that stretch across multiple institutions, private, public, non-profit, and more – with the NRA serving, as it so often does, as the nexus at the heart of things. Because, of course, the folks who call the shots – so to speak – at Freedom Group are heavily represented on the NRA’s Nominating Committee, arguably the most important decision-making body in that institution, and as individuals are major donors to the NRA (in fact, they’re in the “Golded Ring of Freedom” club of million-dollar-plus contributors). And it’s not a far step from that, either, to note the confluences of interest and lobbying activities that link the NRA and the right-wing, corporate-sponsored American Legislative Exchange Council (ALEC) – whose activities in promulgating SYG laws in conjunction with the NRA are a matter of public record. My goal here isn’t to sketch out an org chart, nor to sniff out (not-so) secret pathways of converging interests, nor to finger individuals for blame – although there are plenty of folks in this story who deserve public shame (not that they give a damn about it). Instead, I want to make an observation, at once structural and personal, about our contemporary moment. The continued, outrageous profits raked in by Bushmaster and the insulation of Cerberus in its hypocritical efforts to placate public scorn, combined with the successful legislative advocacy of industry-sponsored groups like ALEC – including but not limited to SYG – represent a twisted state of affairs that is at once classic American capitalism at its worst but also something uniquely of our 21st Century moment. Industries manufacturing products that hurt people, making money hand over fist in the process, and then successfully protecting their interests through shaping legislation are as old as this country itself, as is the pervasive enmeshment of all our financial activities, however ostensibly benign they may seem, in such activities. But the degree of legislative power today’s firearms industry wields – power, I think, rivalling that of players in the financial sector – has no parallel with any other group thanks to the added element of its frankly ludicrous claim to uniquely patriotic standing and a misbegotten Constitutional warrant that has been twisted and deformed beyond all recognition by those with a financially motivated interest to do so. But of course that’s not all of it. It’s not just about lobbyists and lawyers and businesspeople gaming the legislative system, shamelessly declaring their best intentions, and piously gesturing at doing the right thing even as they continue to enrich themselves. It’s about selling people fear, about cultivating their fears to stoke marketplace demand, and about enabling their clientele to act those fears out in the most violent ways imaginable. Let’s get real: there are gun manufacturers and retailers who don’t mind mobilizing insurrectionist fantasies and white supremacist irredentism to move their product. That’s part of their business model. And not just that: they’ve acted, successfully, to change our legislative landscape so that when their clients act on those fears and kill others – children, even – both the killers and their enablers face no blowback whatsoever. Instead, they profit. And let’s get even realer: if our society – with all its hideous double standards – does nothing – nothing, nothing, nothing – when twenty toddlers, nearly all of them white, and in a wealthy community in the Northeast to boot, are slaughtered, mercilessly – what in the name of God would ever drive us to action? I’m not a gambling man, but I’m willing to make my bets on that one. That Town Hall event earlier this week was powerful. It left me feeling hope and conviction. I still feel those things, and believe that SYG can be repealed, and my heart and solidarity is with those who fight towards that end. But against forces so powerful, against exploitation and oppression so thorough and vile and total – beyond simply repealing laws but to changing attitudes, to changing our culture, to changing our way of life – what is to be done? I wish I knew. But I do know that we have to try. Note: I didn’t bring an audio recorder with me to the SYG event, and am working from my handwritten notes. If I’ve gotten any of the quotes – or any other details wrong – please let me know, and I will amend this accordingly. As always, the same goes for the rest of the content in this piece. If you want read more about the NRA Board, you can do so here. If you want to learn more about the geographic breakdown of gun violence in America’s inner cities, I recommend this article. Jason Francisco’s photoseries on Philadelphia’s Murder Corridors, “These Are the Names” is available here. It’s really worth checking out. This entry was posted in Uncategorized and tagged bushmaster, guns, lanza, NRA, race, sandy hook on December 12, 2013 by Pat Blanchfield. And we can become just like the U.K., a country the UN has called the most violent country in Europe, where it is now most often a crime to defend one’s self against a criminal. “Wouldn’t that be loverly …”? FYI, the pharmaceutical industries in the U.S. are about 100X more profitable than the personal firearms industry. The US has an intentional homicide rate of 4.7 per 100,000 people. The UK has an intentional homicide rate of 1.2. Which means we’d be drastically improving our situation if we became like the UK. So yes, good point, that would actually be lovely. Actually in many places in the U.S. you are _much_ safer than a lot of places in the U.K. 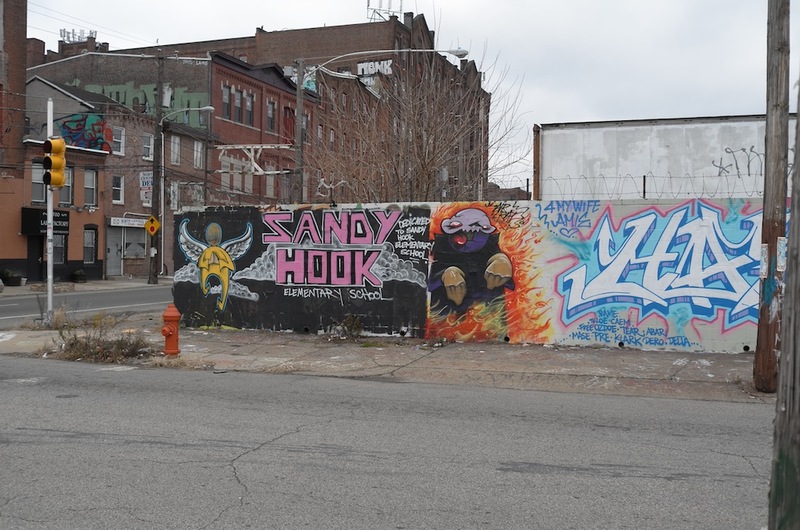 In the U.S. the homicide crime rate is very, very localized in certain areas, i.e., inner cities where a Drug War is being fought, single parent households are predominant, and kids gravitate towards violent gangs, hip hop culture, and drugs. According to FBI stats for 2011 for homicide where the race of the offender was known it was black 52.4% of the time despite blacks being less than 14% of the population. And the victim is most often black. But many cities, where I live and maybe where you live, have homicide and crimes rates as good or better than the U.K. In my small town in Texas the homicide rate is usually 0 per 100K. So comparing the U.K. and the U.S. is largely meaningless unless you actually understand the details. Well, yes, crime is worse or better depending on the area in the US. Are you claiming that’s not also true in the UK? South Kensington, London, I’m guessing, has a pretty low intentional homicide rate. Interesting that the city with the highest murder rate in the US is in a strong gun rights state. I don’t think that’s coincidental. In fact, states that support gun rights tend to have higher murder rates. The three worst states for homicide rates in the US are Louisiana, Mississippi and Alabama. The Brady Campaign rates states for their gun laws, giving higher rankings for more restrictive laws. Louisiana, out of 100 possible points, gets 2. Alabama gets 14. Mississippi gets 4. The South, in general, tends to have higher murder rates than the rest of the country, and it tends to be pro-gun rights. Also, a lot of the guns used in crimes in states with strong gun control come from those states. Hawaii, I think, is a good test case. It’s violent crime rate (taken from US Census) is 36th for the country, and it’s geographic isolation makes it easier to consider the effects of it’s gun laws (i.e. it’s not next to an irresponsible state like Arizona which would enable an inflow of guns). And it is top six for good gun laws (though it only gets three stars, not four, from Brady). Their gun deaths per 100,000 is .54. Their homicide rate per 100,000 is 1.8 (for 2010 http://www.deathpenaltyinfo.org/murder-rates-nationally-and-state). I think it’s interesting to note that even states with lower crime rates have higher rates of gun deaths, and the only state with a lower homicide rate than Hawaii from the bottom six is North Dakota, which is the second-to-last least violent state in the country. And even North Dakota has more gun deaths. The notion that guns don’t majorly contribute to the murder rate is just not plausible. I imagine it is true to some extent in any country, however when you compare New Orleans at 62.1 compared to the national 4.7 rate then obviously there is an extreme spread here. You can compare states and geographic regions in the U.S., but the most extreme differences are between inner cities and everywhere else. It has much less to do with being a “gun rights state” than a social problem in the inner cities. How many in the rest of the list are strong “gun rights states”? But it is greater than both Utah and Idaho which are definitely strong gun rights states. Here is what I think. Comparing at state level is often too coarse a level to measure. Also if you read “Black Rednecks & White Liberals” by Thomas Sowell you will get some insight into the causes of higher violence rates in the south and in black inner city culture. I think you should focus on homicide, not gun homicides. People kill other people, and themselves whether or not they have guns. For example much is made about comparing the U.S. and the U.K. People claim that access to guns increases suicide, but in fact the U.S. and the U.K. have nearly identical suicide rates although guns are much less easy to get in the U.K.
Like I said, people kill people and kill themselves whether or not they have guns. Take a look at the homicide rate in Russia sometime. It greatly exceeds the U.S. although access to guns is much more difficult there. The real causes of homicide and violent crime are cultural, not the result of guns existing. Yes, if you have guns, as for example in the U.S. you will have a lot more gun suicides, but if you look at another similar country like the U.K. you will still have similar suicides, just by different means. When people want to kill others, or themselves they will find a way. But if you believe that it’s exactly why it’s important to look at the violent crime and homicide rates. There are two different questions. A) Does the presence of guns result in more violent crime? and B) Does the presence of guns result in more homicides? A is a complicated question. I’ve got some thoughts on it (high levels of gun violence do terrible things to communities, which have plenty of second and third-order effects) but it’s really not necessary to believe guns do cause violent crime or even have a huge effect on violent crime rates to take a pro-gun control stance. B is pretty obvious. Does ready access to a tool designed to kill people result in more people getting killed? Clearly. And yes, that’s where it’s useful to compare violent crime rates and murder rates. The point is that states with lots of guns tend to have murder rates that are unusually high when compared to their violent crime rate. Which is why Hawaii is useful. North Dakota and Utah have some of the lowest violent crime rates in the country (North Dakota is the second lowest in the country), and yet their homicide rates are comparable to Hawaii’s. To give a somewhat different example. When I was a child I grabbed a saw out of my Dad’s toolshed and cut down one of the trees in our backyard. I think I was about nine years old, and had read a book about Paul Bunyan, and got inspired. Now, only a lunatic would suggest that the easily available presence of saws was unrelated to my cutting down that tree. Without having a tool that was designed to cut down a tree, I probably wouldn’t have done it. I mean, I suppose I could have whittled all day with my pocket knife, but that would have been a lot harder and way less likely. Of course, that doesn’t imply that saws are responsible for youthful impishness. But a father with young boys and a desire to keep his backyard well populated with trees might consider putting a lock on his toolshed. Likewise, if you want less murders in your state, you may want to consider limiting access to effective murdering-people-tools. It is not unusual for people in “group think” to believe their answer is obvious. People use to think that it was obvious that the world was flat. Group think is hard to escape. WOULD BANNING FIREARMS REDUCE MURDER AND SUICIDE? Kates and Mauser argue with a lot of statistics that there really isn’t that much correspondence between the presence of firearms and murder and suicide. They add to the comparison countries that many other advocates seem to ignore (maybe because they don’t fit their pre-conceived notions). My company used to have an office in Switzerland and when I was there I got to know some of them that served in the militia and had fully automatic assault rifles at home with a full load of combat ammunition. However they are a pretty peaceful country. Again, consider the suicide rates between the U.S. and the U.K. The U.S. gun homicide is much larger but the overall rates of suicide are nearly identical. I personally think that it is more important to try to understand why people kill themselves, and perhaps find ways to convince them to not do so, but it doesn’t appear taking away their guns is particularly effective. Again, no big scientific study – just a common sense comparison between two countries that have had a lot in common in the past. Earlier you told me not to compare the US and UK because of cultural differences. Now you’re telling me that the suicide rates are significant because the US and UK are similar? You can’t have it both ways, and anyway, that hardly seems like a common sense comparison for something like suicide rates, which tend to be higher in high latitude countries anyway. To me, a common sense comparison would compare suicides in houses with guns versus suicides in houses without. That seems reasonable, right? Except for one year in Luxembourg, the US is way way above everybody else. That one year in Luxembourg represents a single crime …. Luxembourg is small, wealthy, and has little crime, hence the weird spike. As for your comment about Switzerland, they have about half the guns per person that the US has. And the majority of those guns are related to military service. Assault rifles are generally less of a problem for homicides than handguns. And it’s a very wealthy country. Not much crime to speak of in general. Which is, again, why I think looking very specifically at violent crime rates versus gun homicide rates are so telling. There are plenty of countries with more way more violent crime than the US, and plenty of countries with more or less suicide, and there are plenty of factors that contribute to crime rates, as you yourself have pointed out. So getting into those stats and trying to makes sense of them is important. That’s why it’s nice to see a study comparing suicides among gun households to non-gun households. I hardly think I’m engaged in “group-think” as you call it. There’s a lot of fairly convincing information here, and I still haven’t heard you say anything critiquing the conclusions I made about the stats I quoted (the Mauser study seems to purposely ignore relative stabilities of the countries they compare…also, there are inaccuracies in the paper…was there anything there you found compelling other than their point that there’s a lot of murder in Russia and not so much in Switzerland?). I’m rather enjoying this conversation, by the way. Thanks for discussing with me, LWK. It’s been interesting. I admit to feeling a lot of ambivalence about the gun debate. But, the real violence related to guns has very little to do with SYG. Out of 10,000+ murders every year in this country, how many shooters take a SYG defense? A dozen or two…maybe? The bigger issue is a culture that devalues life. I have read, but not personally confirmed, that the FBI claims that something like 80% of gun violence is related to the illegal drug trade. Whatever the truth it is a lot, and I would include also inner city gang violence. If you look back at my post here on Dec 31 I give homicide rates for some of our cities. New Orleans is literally a war zone with a homicide rate of 62.1 per 100K vs. the national average of 4.7 (which is largely inflated by this inner city violence). The rest of America – outside inner cities where drugs and gang violence contribute enormously to violence – is actually not so bad. Well if the stand your ground (SYG) defense is successful then it is not legally murder. It is justified self defense. And no matter what, if it goes to court you will still have to convince a jury that a mythical “reasonable person” would have found your actions justified (SYG is not a license to murder, as some have tried to assert).